In collaboration with the Climate Change and African Political Stability program at the Robert S. Strauss Center for International Security & Law, the IPD Climate Team has been working to development and test a new coding methdology to track and map international development aid flows that contribute to developing countries' ability to adapt to or mitigate the effects of climate change. 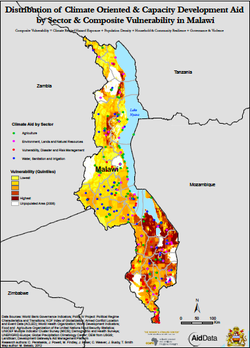 This map shows the distribution of climate oriented and capacity development aid in Malawi. The base layer shows the degree of climate vulnerability (using the complex vulnerability index created by Dr. Josh Busby and his team at the Climate Change and African Political Stability Programs). The dots indicate the locations of climate aid activities embedded in programs within four sectors: agriculture; environment, lands and natural resources; vulnerability, disaster and risk management; and water, sanitation and irrigation. 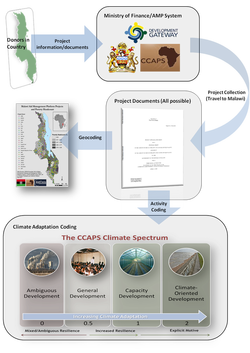 The map was constructed using the CCAPS climate coding methodology, which was applied to all active official development assistance (ODA) projects with Malawi from 27 donors between approximately 2001-2011. The dynamic dashboard developed by the CCAPS program allows users to search and navigate the data, pull up project-level information, and conduct other analyses. The CCAPS climate aid dashboard is available here and the dataset is available here. Tracking Development Aid : Innovations in Data Visualization and Prospects for Tracking Aid for Climate Change Adaptation. By Catherine Weaver, presented at Tech@State, Washington, DC, September 2011. Tracking Climate Aid in Malawi: Results from Pilot Program on Geomapping and Climate Coding. By Justin Baker, Christian Peratsakis and Catherine Weaver, November 2011, Washington, D.C.